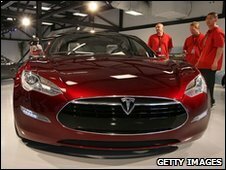 US electric car maker Tesla Motors has raised $226m (£150m) from investors. That was $40m more than had been predicted. The company, which recently saw Toyota invest $50m in return for a 2.5% stake, is the first US car company to go public since Ford in 1956. Toyota hopes that as well as access to Tesla’s electric battery expertise, its investment in Tesla will give it the chance to repair its battered reputation after a series of global vehicle recalls. “The interest in buying Tesla stock increased tremendously after the Toyota announcement,” said Greg Dietrick, a broker at Sharespost. Tesla is also a partner of Daimler, which owns Mercedes and Smart. Last year Tesla agreed to supply lithium-ion power packs and recharging systems for 1,000 Smart electric cars. “You’ve got the company that invented the internal combustion car coming half way around the world to Tesla,” Musk said ahead of the initial public offering of its shares. Analysis: Tesla has built a strong reputation with its high-performance Roadster. But this is not the car investors are buying. Instead, they are buying into the hope that Tesla will put a $465m low-interest loan from the US government to good use and build an assembly plant and electric engine factory in California. They also hope Tesla will produce its planned $50,000 car in time for a launch in 2012, and that consumers will chose this car over rival models from established carmakers. In short, investors are betting that Tesla’s technology will be successful as the motor industry moves ever closer towards electric motoring. If they are right, the returns could be enormous, but there is no doubt that the risks are great. Tesla, which was only formed in 2003, hopes the deal will help launch it onto the world stage. Tesla’s chief executive officer Elon Musk insists investors will benefit from the company’s technology knowledge. “We are a Silicon Valley company. Closer to an Apple or Google than to a GM or Ford in the way we operate the company,” he said. But analysts point out that the company’s earnings potential is limited until it has developed its next car, the Model S.
Tesla’s losses widened to $29.5m in the three months to March from $16m a year ago, and the company expects to continue incurring losses until at least 2012. And however good the company’s technology, Tesla will be up against established carmakers that are also getting ready for the era of electric motoring, industry observers point out. “They are not Google, they are in manufacturing,” said Jeremy Anwyl, chief executive of industry observer Edmunds.